Hazrat Sulaymān Hilmi Tunahan (Q.S.) passed away on Wednesday 16th September,1959 at his home in Kisikli, at the age of 72 (Q.S.). However, his tasarruf (disposal) and irshād (guidance) continue fully and in all its perfection. Because Hazrat Sulaymān Hilmi Efendi (Q.S.) was a Dars al- Ām of Fātih Madrassah, permission was taken from the council of ministers for him to be buried in the grounds of Fātih Mosque. Nevertheless, due to the objections of the Home Secretary of the time, Namik Gedik, he was forcefully buried in a grave dug up by the police in the Karacaahmet Cemetery. 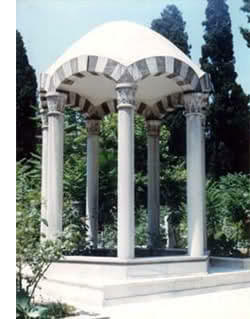 Later on, a shrine, standing on seven marble columns, with opwn sides, was built. His shrine, Qabr al-Sharīf, is visited today by millions of Muslims from all corners of the world. May Allah (Ta’āla) bless his lovers and all Muslims at large with his shafā’ah (intercession).